Search for webmessage name=kmsgHeaderBIBrandName and change the text in <TEXT> </TEXT> tag. Connection Pool for the database “Oracle BI Application Configuration” (BIACM Repository Data) is wrong. 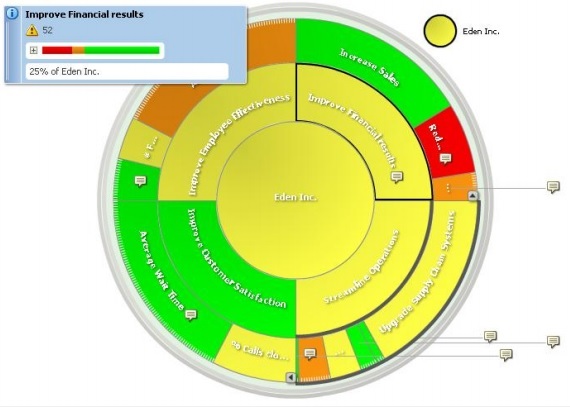 Contribution Wheel: The Contribution Wheel is a new visualization available with the Oracle Scorecard and Strategy Management product, a part of the Oracle Business Intelligence Foundation Suite. It is a variation of the Scorecard Strategy Tree document type, and is an example of a space-constrained, hierarchical visualization. 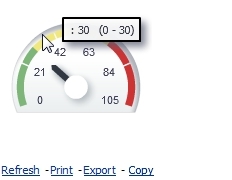 One of its unique advantages is that it makes it possible to view the relative weights assigned to a KPI or objective. At a glance, it is possible to see not only how much weight a particular KPI or objective contributes within its siblings at the same level, but also how much the specific KPI or objective contributes to the overall performance. This view is available as a rich, interactive visualization on desktop browsers as well as on mobile devices, where it supports touch and multi-touch gestural interactions. Trellis views, also known as multi-panel visualizations, or grid-of-charts, are ideal for visualizing large datasets as well as multivariate data. Each cell in the grid can bevisualized as a microchart. A wide choice of visualizations is available to be used as these embedded visualizations. Both microcharts as well as traditional visualizations can be used. To make it easier for users to create these Trellis views, a choice of Simple and Advanced Trellis views is offered. These Trellis views are first-class views within the product, and therefore can participate in the full life-cycle of other views, and be published to Dashboards, and support drills, master-detail eventing, Actions, filters, scheduling, and more. And like other views, Trellis views are available as interactive views on the new Oracle BI Mobile app. Line & Route Geo-Spatial Visualizations: Geo-spatial visualizations as first-class views in the BI suite. Apart from visualizing and formatting shapes and points, map views now support visualizing line also. Typical examples of line geometries include airline routes, rail traffic, highways usage, or even hurricane paths. These line geometries can be formatted using a point-and-click interface in Map Views, and a rich palette of colors is available for users to segment their data on. Users can combine shapes, points, and lines on the same map. For example, a color-fill can be used to display data at the state level, color-coded lines to format highway traffic for different state highways, while points can be used to format the toll collection at different toll booths across the highways. As with other views, users can click to get rich tooltips, drill, invoke master events, and Action Links on map view formats. 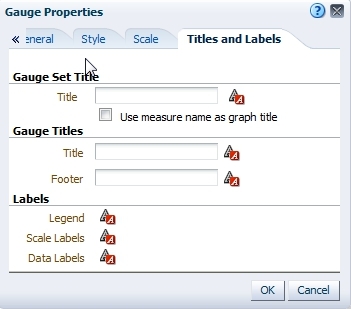 Additional Info via Feature Themes: Map views, as geo-spatial visualizations in Oracle BI are called, now support displaying non-BI information. It is very useful at times to bring in and display additional information on a map; information Not all information is available in a data warehouse that a BI system reports on. Sometimes additional context is useful to have. Optimized and Available on Tablets: All these visualizations, like other views in Oracle BI, are also available on the Oracle BI Mobile app, without requiring any rewrite. These visualizations are optimized for interactions via touch and multi-touch gestures. What Is the Recommended Visualizations Feature? 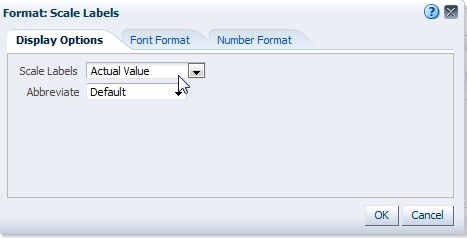 Oracle BI gives recommendation feature when the view are being created. When the create new view is being donw, a list of recommended view types are provided. The recommended visualizations feature works by gathering information on your inputs for a view, such as number of dimensions, number of members, and so on. It then determines the optimal layout for each possible view. This is an interesting and more useful features for the analysts and developers who are not sure which view would be best for the data set. Way to go ! The impact of analytics on business, society and our own personal lifestyles has been greater than anyone could have imagined. Transparent organizations have strengthened business relationships and created new revenue opportunities by making information available to customers, partners and suppliers. Advances in cognitive computing and predictive analytics have made information systems more decisive, enabling businesses to optimize millions of daily decisions. And the next phase is upon us, where personal analytics start to challenge existing business models by collecting precise data using social media monitoring and real-time sensors to personalize every customer experience. But as capabilities are stretched, how far is too far? When are targeted offers too personal? When do we need more human involvement in the algorithms making our decisions? How will you seize the opportunity, while mitigating the risks? The markets for BI platforms, advanced analytics, DBMS for data warehousing, and BI and analytics service providers are highly dynamic with significant complexity for buyers. Gartner Magic Quadrants are a culmination of research in a specific market, giving you a wide-angle view of the relative positions of the market’s competitors. This is your chance to hear Gartner analysts at their best — unbiased, unscripted and unfiltered. It is also your chance to ask the questions that will help you with your investments. For some reasons DAC service was going down. So we wanted a script that checks if the DAC service is down and start. When I simply started the DAC service and scheduled that batch file it was stopping the DAC service sometimes and then starting. The below batch file can be used.